Serum levels of vitamin D levels are commonly reduced in patients with rheumatoid arthritis (RA) and have been implicated in disease pathogenesis. We recently identified a new vitamin D receptor transcriptional signature in synovial tissues from rats with mild and nonerosive arthritis, suggesting a vitamin D-mediated protective effect. In the present study, we address the hypothesis that part of the vitamin D protective effect is mediated via interference with fibroblast-like synoviocyte (FLS) invasive properties, an in vitro cellular phenotype that correlates with radiographic and histological damage in pristane-induced arthritis and RA. FLSs derived from DA rats with pristane-induced arthritis and RA patients were studied in an in vitro model of invasion through a collagen-rich barrier (Matrigel) over a 24-h period, in the presence or absence of calcitriol, an active form of vitamin D. Matrix metalloprotease (MMP) expression levels were analyzed with zymography and quantitative real-time polymerase chain reaction, and the cytoskeleton was studied with immunofluorescense microscopy. Calcitriol significantly inhibited DA and RA FLS invasion by 54% and 53%, respectively. Calcitriol also reduced interleukin (IL)-1β-induced expression of MMP-1 by 95% in DA FLSs and by 73.5% in RA FLS. Calcitriol treatment reduced actin cytoskeleton reorganization, reduced polarized formation of lamellipodia and reduced colocalization of phosphorylated focal adhesion kinase (p-FAK) with lamellipodia, all consistent with reduced cell ability to move and invade. In conclusion, we identified a new effect of calcitriol in FLS invasion. This discovery suggests that the reduced serum levels of vitamin D and its metabolites commonly seen in RA might increase risk for FLS-mediated cartilage and bone invasion and erosions. Treatment with vitamin D or its analogs has the potential to become a helpful adjuvant aimed at preventing or reducing joint destruction. Rheumatoid arthritis (RA) is a chronic autoimmune disease that affects 0.5% to 1% of the population (1) and is associated with increased risk for developing joint deformities, disability and reduced life expectancy (2, 3, 4). The synovial tissue in RA is characterized by pronounced hyperplasia, also called pannus, which contains inflammatory cells, produces several proinflammatory mediators and proteases and invades and destroys cartilage and bone (2). The regulation of these processes remains incompletely understood. To identify genes and molecular processes implicated in the development of synovial hyperplasia and its destructive behavior in arthritis, we studied synovial tissues from rats with severe and erosive disease and from rats with mild and nonerosive disease in genome-wide expression analyses using microarrays (5). 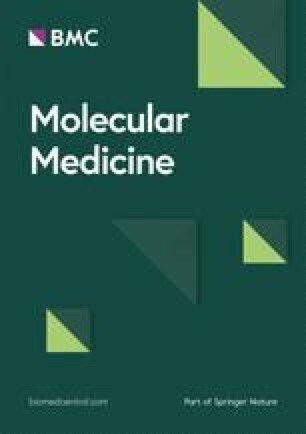 Those studies identified an increased expression of nuclear receptors (NRs), including liver X receptor alpha (Lxrα), peroxisomeproliferator-activated receptor gamma (Pparγ) and retinoic acid receptor gamma (Rxrγ), as well as NR target genes in synovial tissues of protected rats, suggesting a new antiinflammatory and homeostatic role for NRs. Although the vitamin D receptor (VDR) (also an NR) itself was not differentially expressed, there was an overrepresentation of VDR target genes among the genes with increased expression in synovial tissues from arthritis-protected rats, suggesting increased VDR activity. Furthermore, genes implicated in the hydroxylation and synthesis of alternative vitamin D active metabolites such as Cyp27a1, Cyp2j3 and Cyp11a1 (6,7) were also expressed in increased levels in the tissues of the protected rats, suggesting that the increased expression of target genes could be related at least in part to increased local production of VDR agonists (5). There is mounting evidence suggesting that vitamin D has a role in RA pathogenesis. Vitamin D deficiency is common in RA (8, 9, 10) and correlates with increased risk of bone loss and disease severity, as well as increased risk for disability (9,10). Rodents deficient in vitamin D are more susceptible and develop more severe disease and damage in experimental arthritis (11). Treatment with VDR agonists reduces disease severity and joint damage in experimental arthritis (12). Vitamin D and analogs interfere with several aspects of immune responses central to RA pathogenesis, including cellular responses to interleukin (IL)-1β and tumor necrosis factor-α (13), the expression of IL-1β and IL-6 (14), differentiation of Th17 (15) and B cells (16) and the expression of proteases such as matrix metalloprotease (MMP)-1 and MMP-2 (14). Fibroblast-like synoviocytes (FLSs) have a central role in the development of synovial hyperplasia and joint destruction in RA (17,18), and joint erosions correlate with increased risk for disability and reduced quality of living (19). We, and others, have shown that the in vitro invasive properties of FLSs through collagen-rich Matrigel correlate with radiographic erosive changes and with histological joint damage in patients with RA and in rats with pristane-induced arthritis (PIA) (20,21). Because vitamin D deficiency correlates with increased risk for erosive disease and treatment with VDR agonists reduce joint damage, we hypothesized that the increased VDR signature in rats with mild and nonerosive arthritis could identify a new inhibitory pathway of FLS invasion. We tested the hypothesis with 1,25-dihydroxyvitamin D3 (calcitriol), which is an active form of vitamin D.
Arthritis-susceptible DA/Hsd rats were purchased from Harlan (Indianapolis, IN, USA) and housed in a specific pathogen-free environment. The 8- to 12-wk-old rats received 150 µL pristane by intradermal injection, divided into two sites at the base of the tail (22,23). On d 21 after pristane injection, animals were euthanized and synovial tissues were collected from the ankle joints for FLS isolation. All animal work was approved by the Feinstein Institute’s Institutional Animal Care and Use Committee. Synovial tissues were obtained from RA patients undergoing elective orthopedic surgery. All patients met the American College of Rheumatology criteria for RA (24). Clinical characteristics of the RA patients are shown in Table 1. Informed consent was obtained from all participating subjects under an institutional review board-approved protocol. Clinical characteristics of the rheumatoid arthritis patients. FLSs were obtained as previously described (20). Briefly, tissues were minced and incubated with a solution containing 0.15 mg/mL DNase, 0.15 mg/mL hyaluronidase type I-S and 1 mg/mL collagenase type IA (Sigma, St. Louis, MO, USA) in DMEM (Invitrogen, Carlsbad, CA, USA) for 1 h at 37°C. Cells were washed and resuspended in complete media containing DMEM supplemented with 10% fetal bovine serum (FBS) (Invitrogen), 300 ng/mL glutamine, 250 µg/mL amphotericin B (Sigma) and 20 ng/mL gentamycin (Invitrogen). After an overnight culture, nonadherent cells were removed and adherent cells were cultured. All experiments were performed with FLSs after passage four (>95% FLS purity). The in vitro invasion of FLSs was assayed in a transwell system using Matrigel-coated inserts from BD (Franklin Lakes, NJ, USA) as previously described (20,21). Briefly, 70% to 80% confluent cells were harvested by trypsin-EDTA digestion and resuspended at 2.0 × 104 cells in 500 µL serum-free Dulbecco’s modified Eagle’s medium (DMEM). Cells were placed in the upper compartment of the Matrigel-coated inserts. The lower compartment was filled with complete media (described above), and the plates were incubated at 37°C for 24 h. After 24 h, the upper surface of the insert was wiped with cotton swabs to remove noninvading cells and the Matrigel layer. The opposite side of the insert was stained with Crystal Violet (Sigma), and the total number of cells that invaded through Matrigel was counted using light microscopy at magnification 100x. Experiments were done in duplicate. Calcitriol (Cayman Chemical, Ann Arbor, MI, USA) or the diluent dimethyl sulfoxide (DMSO) (control) was added to serum-free medium (DMEM with antibiotics and glutamine) in the upper chamber, at the concentrations indicated in Results. MMP levels and catalytic activity was determined in FLS culture supernatants using gelatin (MMP-2, MMP-9) zymography as previously reported (20). Briefly, equal volumes of supernatants from the upper chamber of the Matrigel-coated invasion system were mixed with Tris-glycine-SDS sample buffer (Invitrogen), loaded into a zymogram precasted gel (Invitrogen) and run for 90 min at 125 V. After electrophoresis, gels were treated with renaturing buffer (Invitrogen), followed by overnight incubation in a developing buffer (Invitrogen) at 37°C. Gels were stained with SimplyBlue Safe-Stain (Invitrogen) for 1 h at room temperature and were then washed extensively. The same supernatants used for zymography as described above were also used for MMP-3 quantification. Equal volumes of the upper chamber supernatants were loaded into a NuPAGE 10% Bis-Tris gel (Invitrogen) in the presence of 2-(N-morpholino)ethanesulfonic acid MES buffer (Invitrogen) and run in reducing conditions. Proteins were transferred overnight to a polyvinylidene fluoride membrane (Immobilion, Millipore, Bedford, MA, USA). The membrane was then blocked with 5% blotting grade nonfat dry milk (Bio-Rad, Hercules, CA, USA) and incubated with the rabbit monoclonal antibody anti-MMP-3 (Abcam, Cambridge, MA, USA). Horseradish peroxidase-conjugated anti-rabbit IgG antibody (GE Healthcare, Buckinghamshire, UK) was used as the secondary antibody. Protein bands were detected with Amersham ECL plus (GE Healthcare, Pittsburgh, PA, USA) and visualized using X-OMAT Kodak films. Immunofluorescence was done as previously described (25). Briefly, FLSs were cultured on coverslips to a 10% to 20% confluence and then starved overnight and treated with either DMSO or calcitriol in 10% FBS for 20 min, at the concentrations used in the invasion experiments. The cells were then fixed with 4% formaldehyde (Ted Pella, Redding, CA, USA) for 15 min at room temperature followed by permeabilization of the cells with phosphate-buffered saline (PBS) plus 0.1% Triton X-100 for 5 min. The 5% nonfat milk (30 min) was used to prevent nonspecific binding. Cells were incubated with rabbit anti-phosphorylated focal adhesion kinase (anti-p-FAK) antibody (Cell Signaling) for 1 h at room temperature, washed and then incubated with Alexa Fluor 488 donkey anti-rabbit IgG antibody (Invitrogen). Cells were washed with PBS and incubated with Alexa Fluor 594 Phalloidin (actin filament staining; Invitrogen) for 15 min. The stained cells were washed with PBS and mounted on a glass slide. A Zeiss Axiovert 200M fluorescent microscope was used for visualization with the appropriate filters, with Zeiss Axioversion 4.7 software (Jena, Germany). Cells were scored using a previously reported method (26). Briefly, we evaluated four major parameters: (a) actin filament characteristics and distribution (0 = no filaments, 1 = fine filament at the center of the cell, 2 = at least two thick filaments at the center of the cell, 3 = 90% thick filaments); (b) cell morphology (0 = round shape, 2 = fusiform/linearized shape); (c) lamellipodia localization (0 = no lamellipodia or lamellipodia present all around the cell, 2 = polarized formation on one side of the cell); and (d) distribution of p-FAK (0 = all around the cell edges or in the nucleus, 1 = homogeneous distribution, 2 = pronounced colocalization with lamellipodia). The cell scoring ranged from 0 to 9, and a minimum of 10 cells per treatment group and per cell line were analyzed. Results are shown as the percentage of control. One investigator (T Laragione) read all the slides without knowledge of the group identity. Forty thousand FLSs per well were plated in triplicate in 96-well plates in 100 µL complete media. Cells were allowed to adhere for 24 h. Media were then changed to serum-free media and either DMSO or calcitriol at the concentrations used in the invasion experiment (50 nmol/L for DA FLSs and 1 µmol/L for RA FLSs). After 24 h (same duration of the invasion experiments), cell survival was determined using the colorimetric MTT kit (Millipore) according to the manufacturer’s instructions [MTT: 3-(4,5-dimethylthiazol-2-yl)-2,5-diphenyltetrazolium bromide]. Total RNA was extracted from FLSs using the RNeasy Mini Kit (Qiagen, Valencia, CA, USA) according to the manufacturer’s instructions. Samples were digested with DNase (Qiagen) and eluted with 30 µL RNase-free water. RNA was quantified and assessed for purity using the NanoDrop spectrophotometer (Rockland, DE, USA); 200 ng of total RNA from each sample was used for cDNA synthesis with the Superscript III kit (Invitrogen). We used the Universal ProbeLibrary (Roche, Indianapolis, IN, USA), and the probes were used at a final concentration of 250 nmol/L. Primers targeting rat and human genes were designed using the Universal ProbeLibrary Assay Design Center (Roche) and were used at a 400 nmol/L concentration with Absolute Blue QPCR Master Mix (Thermo Scientific, Logan, UT, USA). The Roche 480 qPCR thermocycler was used at 95°C for 10 min, and 45 cycles of 95°C for 0.15 min and 60°C for 1 min. Samples were run in duplicate and the mean was used for analysis. Data were analyzed using LC480 software version 1.5 (Roche). Results were obtained as Ct (threshold cycle) values. Relative expression of all genes was adjusted for GAPDH (glyceraldehyde-3-phosphate dehydrogenase) in each sample (ΔCt), and the ΔCt was used for t test analysis. Fold differences were calculated with the 2−ΔΔCt method (27). Means were compared with the t test and median with the Mann-Whitney test using SigmaStat 3.0 (SPSS, Chicago, IL, USA). A P value ≤0.05 was considered significant. Treatment of highly invasive DA FLSs with 50 nmol/L calcitriol significantly decreased the number of cells invading Matrigel over a 24-h period by 54% compared with the DMSO control (Figures 1A, B; n = 5 per group; P = 0.003, t test). Calcitriol concentrations were titrated, and ≥1 µmol/L significantly decreased invasion of RA FLSs by 53% (Figures 1C, D; n = 5 per group; P ≤ 0.001, t test). 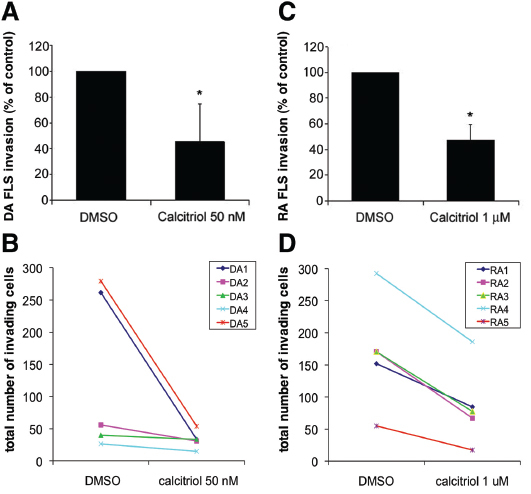 Calcitriol significantly reduces DA and RA FLS invasion. (A) Calcitriol reduced DA rat FLS invasion by 54% (n = 5 per treatment group). (B) Total cell counts of DA FLS invasion treated with DMSO or calcitriol. (C) Calcitriol treatment reduced RA FLS invasion by 52.5% (n = 5 per group). (D) Total cells counts of RA FLS invasion treated with DMSO or calcitriol. *Mean ± standard deviation (SD); P ≤ 0.003. The calcitriol concentrations used in the invasion experiments were not toxic for DA or RA FLSs, as shown by the MTT assay done over a 24-h period (data not shown; same duration of the invasion experiments). Treatment of DA FLSs with IL-1β (50 pg/mL) increased MMP-1 expression by 31-fold compared with DMSO-treated controls (Figure 2A). Calcitriol used at the same concentrations that suppressed invasion (50 nmol/L) completely inhibited (95% inhibition) the IL-1β-induced MMP-1 expression in DA FLSs (n = 6, see Figure 2A). In RA FLSs, IL-1β was titrated for maximal MMP-1 expression, and 5 ng/mL induced a 12-fold increase in MMP-1 expression, whereas calcitriol treatment (1 µmol/L) significantly inhibited the IL-1β-induced expression by 73.5% (n = 4, Figure 2B). 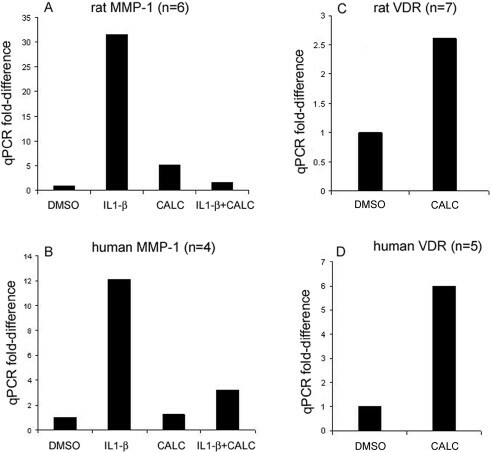 Quantitative polymerase chain reaction (qPCR) analyses of MMP-1 and VDR in FLSs. Calcitriol (CALC) suppresses IL-1β-induced expression of MMP-1 in FLS from DA (50 nmol/L) by 95% (A) and in FLS from RA (1 µmol/L) by 73.5% (B). Calcitriol treatment for 24 h increased VDR mRNA levels by 2.6-fold in DA FLSs cultured on polystyrene plates (50 nmol/L; n = 7 per group; Figure 2C) (C) and by sixfold in RA FLSs cultured on Matrigel compared with DMSO control (1 µmol/L; n = 5 per group) (D). mRNA levels of MMP-2, MMP-3, MMP-14 and TIMP-1, and protein levels of MMP-2 and MMP-3, were not significantly affected by calcitriol treatment. Calcitriol (50 nmol/L) increased VDR mRNA levels by 2.6-fold in DA FLSs (n = 7; Figure 2C). Unlike DA FLSs, RA FLSs cultured on polystyrene plates in the presence of calcitriol did not have increased levels of VDR mRNA (data not shown). We next cultured RA FLSs on Matrigel to recreate the invasion chamber environment and to provide collagen and other extracellular matrix proteins. Calcitriol (1 µmol/L) induced a sixfold increase in VDR expression in RA FLSs cultured on Matrigel compared with DMSO control (Figure 2D, n = 5), suggesting that by increasing the receptor expression, VDR agonists can potentially increase cell sensitivity to agonists, further enhancing the response. DA and RA FLSs treated with 10% FBS and DMSO as control had the typical elongated shape of moving cells, with several thick actin filaments running parallel in one direction on the cells. The majority of those cells had directional formation of lamellipodia at one edge of the cells with colocalizing p-FAK expression (Figures 3A, B and C for DA and Figures 3G, H and I for RA). Calcitriol prevents cytoskeleton and morphological changes required for FLS invasion. DA (A–C) and RA (G–I) FLSs treated with DMSO have an elongated shape, with thick and longitudinal actin filaments, polarized formation of lamellipodia and p-FAK colocalization with lamellipodia. Calcitriol-treated DA (D–F) and RA (J–L) FLSs have a round, nonfusiform shape, with disorganized actin fibers and with either no lamellipodia formation or a nonpolarized formation of lamellipodia-like structures around the cell rim. These lamellipodia-like structures do not colocalize with p-FAK, which in calcitriol-treated cells tends to have a diffuse distribution (red = p-FAK; green = phalloidin-FITC-actin staining; images are representative of four different DA and five different RA FLS cell lines; bar in the picture = 10 µm) (magnification 630x). In contrast to DMSO-treated FLSs, cells treated with calcitriol had a significantly different morphology (Figures 3D, E and F for DA and Figures 3J, K and L for RA). Specifically, both DA and RA FLSs treated with calcitriol had reduced numbers of thick actin filaments (23% and 34%, respectively, compared with 65% and 82% in DMSO-treated FLSs; DA: Figure 4A; RA: Figure 4E; P < 0.05, t test), compared with DMSO-treated cells, and a more rounded shape with fewer elongated cells (37% and 28%, respectively, compared with 94% and 98% in DMSO-treated FLSs; DA: Figure 4B; RA: Figure 4F; P < 0.05, t test). 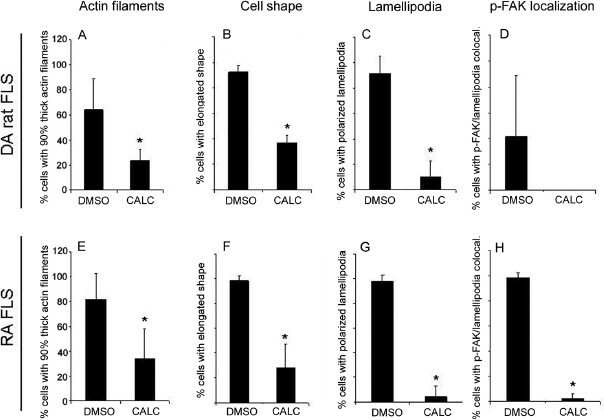 Lamellipodia formation at the leading edge of the cells, which is required for cell movement and invasion, was present in 93% of DA and 98% of RA FLSs treated with DMSO, but only in 10% and 4% of the calcitriol-treated cells, respectively (DA: Figure 4C; RA: Figure 4G; P < 0.05, t test). p-FAK colocalized with lamellipodia in 42% of DA FLSs and 98% of RA FLSs treated with DMSO, whereas calcitriol-treated cells had a predominantly homogenous distribution in DA (68.3%) and RA (66%) (DA: Figure 4D; RA: Figure 4H, P < 0.05, t test). Scoring of DA and RA FLSs immunofluorescence. DA FLSs cultured on glass slides in the presence or absence of calcitriol (CALC) were scored for actin filament characteristics, cell shape, lamellipodia formation and location and p-FAK localization (see Materials and Methods for details). 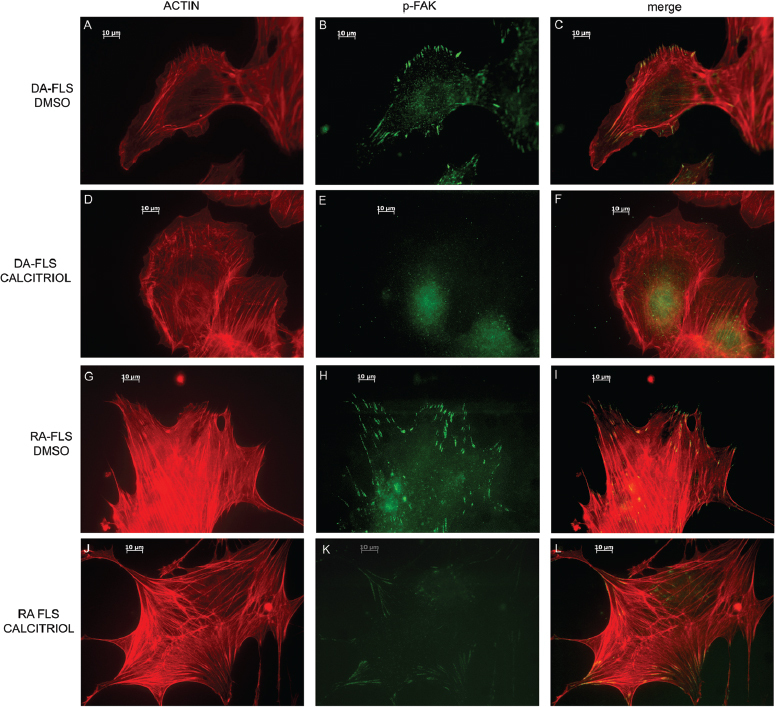 Calcitriol treatment significantly reduced the number of cells with thick actin filaments (A, E), the number of elongated cells (B, F), the formation of polarized lamellipodia (C, G) and the colocalization of p-FAK with lamellipodia (D, H) (*P< 0.05, t test; data shown as mean ± SD; DA, n = 4 per treatment group [50 nmol/L calcitriol); RA, n = 5 per treatment group [1 µmol/L calcitriol)). Disease severity and joint damage are important outcome parameters that strongly correlate with risk for disability, deformities and reduced life expectancy in RA (28, 29, 30, 31). Vitamin D deficiency correlates with increased disease severity and joint damage in RA (9,10) and in rodent models of arthritis (11). Treatment with vitamin D and analog VDR agonists have been shown to reduce disease severity and joint damage in experimental arthritis (12,32), including collagen-induced arthritis (33,34). Vitamin D exerts its activity via the VDR, which is an NR with both genomic and nongenomic activities. Vitamin D can potentially regulate arthritis pathogenesis and disease severity through several of its known effects, such as interference with IL-1β and IL-6 expression and activity, production of MMPs (14), differentiation of Th17 cells, which are central to autoimmunity and RA (15), and differentiation of B cells (16). In the present study, we report a new activity of vitamin D/calcitriol, where it inhibits the invasive properties of FLSs from patients with RA and DA rats with PIA. The in vitro invasive properties of both RA FLSs and DA rat FLSs studied herein correlate with in vivo radiographic and histological joint damage (20,21), making our observations clinically relevant. Additionally, we describe a mechanism of action where calcitriol interferes with the expression of MMP-1, which is a protease implicated in cartilage and bone damage in RA (35), and with cytoskeletal rearrangement and lamellipodia formation, which are required for cell motility and invasion (36). These observations support our original hypothesis that VDR stimulation could have a central role in the regulation of synovial processes implicated in cartilage and bone erosive joint damage. Calcitriol also increased FLS expression of VDR, suggesting that, in addition to its direct invasion-suppressing effects, calcitriol is at the same time rendering the FLSs more sensitive to its agonistic activity. Others have also previously reported that VDR agonists increase VDR expression in RA FLSs (37). Interestingly, increased expression of VDR is associated with favorable prognosis in several cancer cells, and part of that effect is due to the ability of the VDR to decrease cell invasiveness and risk for metastasis (38, 39, 40, 41), which fits our observations with FLSs. In conclusion, we have identified a new role for the vitamin D active metabolite calcitriol, a VDR agonist, in reducing FLS invasion. Both FLS invasion and vitamin D deficiency correlates with increased risk for joint damage in RA; therefore, we consider that vitamin D (or active natural or synthetic analogs) supplementation could be a potentially safe, inexpensive and beneficial adjuvant therapy aimed at reducing disease severity and protecting cartilage and bone from erosive damage. The authors wish to thank Cathleen Mason and Mary Keogh of the Feinstein Institute’s Tissue Donation Program for their assistance in obtaining the RA synovial tissues used in this study. This study was funded by the National Institutes of Health, grants R01-AR46213, R01-AR052439 (NIAMS) and R01-AI54348 (NIAID), to PS Gulko.